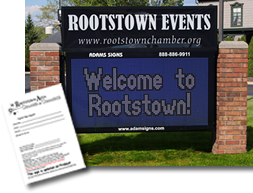 The Rootstown Chamber electronic sign at the center of town is a great way to get your event noticed. Fill out the electronic sign message form. Details and pricing are on the form. NEW: non-members can now pay the sign message fee online. Download the sign message form for details and pricing, then click the Pay Now button below to be redirected to the online payment webpage. What a year we have ahead with so many ways to network your business, get to know fellow chamber members and learn industry professionals. Keep an eye out here and the chamber email blasts for more details and registration information. Mark your calendars! Below are the scheduled 2019 chamber luncheons and speaker information. Then, watch your email for details and registration links for the upcoming Multi-Chamber Events: A night with the Akron Rubber Ducks (July 19th), and a BIG multi-chamber business after hours (April 23rd) coming up as well. Download a copy of the meeting schedule and special events dates.